In this Audio Lecture of 29 minutes I have traced in brief the details of the entry of East India Company in India in 1600 and the obtaining of Diwani right in 1765. Full explanation point wise of why the Regulating Act of 1773 was passed by the British Government is being given in this Audio Tutorial of Regulating Act of 1773. 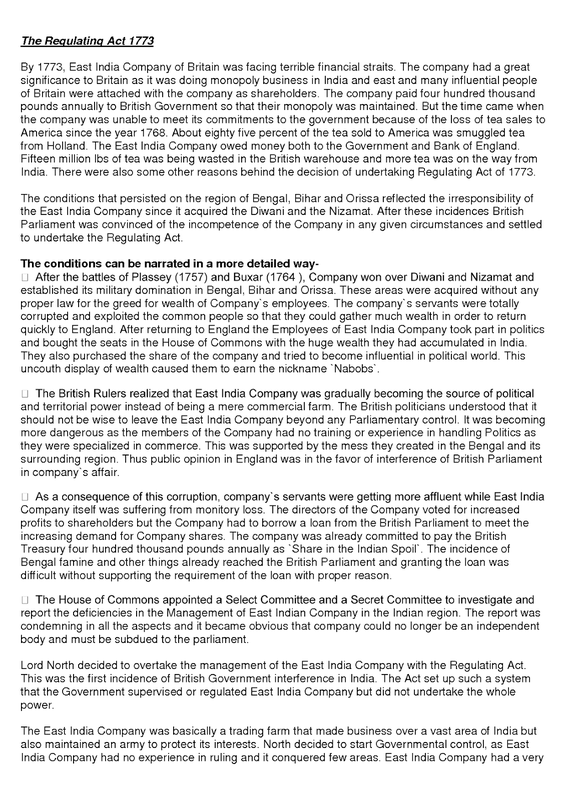 Details about why control was increased over the functioning of the East India Company and it s servants. A slightly modified system of administration was imposed by the British Government over the civil, political,administrative and military affairs of the East India Company. After listening this Audio Tutorial in the next Audio Tutorial I will upload the Audio Lecture of Regulating Act of 1784 where the shortcomings of Regulating Act of 1773 were removed. So hearing these Audio Tutorials serial wise will help you understand the system of administration that was prevalent at that time. DO REMEMBER TO LEAVE YOUR COMMENTS AND ENCOURAGE ME IF YOU LIKE THESE AUDIO LECTURES. ALSO IF YOU WANT AUDIO LECTURES OF YOUR PARTICULAR INTEREST FIELDS KINDLY TELL ABOUT THAT ALSO IN THE COMMENT SECTION. I HOPE YOU GUYS WILL LIKE MINE SMALL STINT OF ONLINE EDUCATION DISTRIBUTION. sir these lectures are really helpful for begginers,can u upload General Science lectures also..